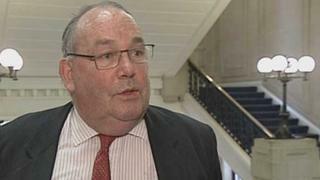 Former Conservative government minister and Scotland's chief law officer Lord Fraser of Carmyllie has died suddenly at the age of 68. As Peter Fraser, he was an MP for Angus and became a life peer in 1989. During his time as Scotland's lord advocate, he was responsible for the investigation into the Lockerbie bombing. He later conducted a major public inquiry into the handling of the Scottish Parliament building project. Scottish Conservative leader Ruth Davidson said: "Peter brought a formidable intellect to both parliament and government. "He loved Angus - the area he represented as an MP for so many years, and where he continued to live until his sudden death. "A hugely engaging figure, he was passionate about both history and the law." A funeral service for Lord Fraser's extended family is being organised and a more public thanksgiving service will be held in a few weeks. Lord Fraser is survived by his wife, their children Jane, Jamie and Katie and seven grandchildren. His widow, Lady Fiona Fraser, said: "All of my family are with me in Carmyllie and we are completely devastated by Peter's sudden and unexpected death. "On Friday we were making arrangements and filling our diaries with plans for holidays, the Open Golf championship, visits to family and friends and the christening of latest granddaughter, Delphin, and the next morning he was gone." Lord Fraser was born in 1945 and educated at Loretto School in Musselburgh before Cambridge and Edinburgh University. He was called to the Scottish Bar in 1969 and became Conservative MP for Angus in 1979. Prime Minister Margaret Thatcher appointed him as solicitor general for Scotland in 1982, and after he lost his seat to the SNP in 1987 he was made a life peer and became lord advocate. As Scotland's top prosecutor, he had ultimate responsibility for the investigation into the Pan Am 103 Lockerbie bombing, which caused the deaths of 270 people. He issued the indictment against two Libyans charged with the bombing the plane over the Scottish town, in what was Scotland's biggest criminal investigation. Abdelbaset al-Megrahi was later convicted of smuggling a bomb aboard the New York-bound flight but his co-accused, Al Amin Khalifa Fhimah, was acquitted. Lord Fraser was also minister of state at the Scottish Office from 1992 to 1995 and served as a minister at the Department of Trade and Industry and the Department of Energy. He was shadow Deputy Leader of the House of Lords but quit in protest after then party leader William Hague sacked Lords leader Viscount Cranborne in a dispute over the retention of hereditary peers in 1998. In 2003, he presided over the official inquiry into the massive costs of, and delays in building, the Scottish Parliament. Lord Fraser famously proclaimed that, with the exception of the Scottish Parliamentary Corporate Body accepting some responsibility for increased costs, "the ancient walls of the Canongate echoed only to the cry of It wis'nae me!". Scotand's First Minister Alex Salmond said: "Lord Fraser leaves an outstanding record of public service to Scotland as a politician and, particularly, as lord advocate. "More recently, he readily agreed to serve as an independent adviser to the Scottish government on the Ministerial Code, another public service he performed without fear, favour or any remuneration." Scottish Labour leader Johann Lamont said: "Lord Fraser dedicated his life to public service and enjoyed a remarkable career, from the Lockerbie investigation to the inquiry into the parliament. "He was a popular figure across the political divide and I know he will be greatly missed."